VANCOUVER—Among the enthusiastic audience at the opening show of Shen Yun Performing at Queen Elizabeth Theatre on Friday night were Bryan Williams, former chief justice of the Supreme Court of British Columbia, and his wife, Audrey Williams, a B.C. Sports Hall of Famer. 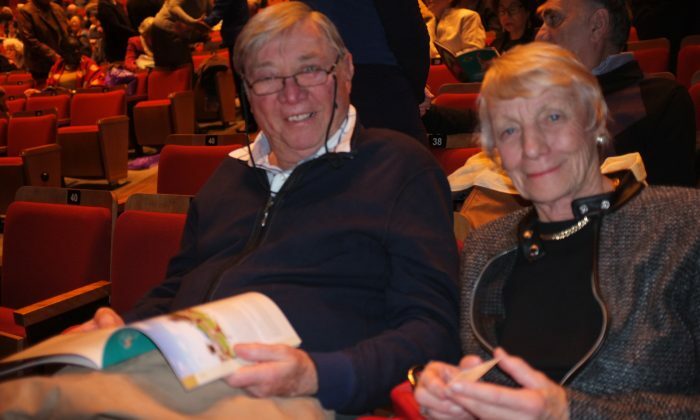 The couple thoroughly enjoyed the renowned classical Chinese dance and music performance put on by New York-based Shen Yun. “I’m enjoying it very much,” said Mr. Williams. “I love it,” said Mrs. Williams, an Olympics figure skating judge who was involved for over 50 years in the sport and was inducted into the B.C. Sports Hall of Fame in 2011. “I think it’s really good. It’s interesting the way they used the music and I really think it’s very well done. The dancers are terrific,” she added. The Shen Yun Orchestra is among a number of prominent features that make the renowned performing arts company unique. It combines traditional Chinese instruments with classical Western instruments, taking advantage of the “spirit, beauty, and distinctiveness of Chinese music” as well as “the precision, power, and grandeur of the Western symphony orchestra,” states the Shen Yun website. Shen Yun also features award-winning vocalists who use the bel-canto operatic technique to sing Chinese lyrics. The show’s use of striking digitally animated backdrops, another hallmark of Shen Yun, was another highlight for Mrs. Williams. “It’s fascinating … people coming and going [into and out of the screen]. It’s lovely,” Mrs. Williams said about the animation, which synchronizes seamlessly with the movement of the dancers on the stage.